Le Brasilia is a truly outstanding 5 star campsite that’s set within 15 hectares of wooded grounds, along the south coast of France. The campsite is part of the Yelloh Village group of campsites and as such offers visitors the perfect place for a family holiday, with not only a great location but also a superb range of both facilities and activities on offer both on-site and also nearby. 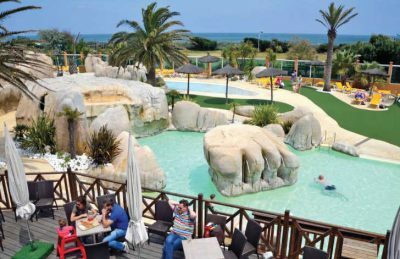 If you’re looking for a fun filled campsite in the south of France with plenty to keep you busy then take a look at La Brasilia campsite, you won’t be disappointed. Evenings whilst you’re on holiday can be spent in a number of ways. The local town of Canet-en-Roussillon is a short distance away and offers a variety of restaurants, however Le Brasilia itself boasts a great restaurant, a pizzeria and a take away, along with a bar and variety of different entertainment during high season. Le Brasilia is very fortunate to benefit from direct access to a wonderful sandy beach which is perfect for families of all ages. The golden sand and warm Mediterranean sea provides the perfect place for you to play games, swim, build sandcastles, sunbathe and most importantly of all, have fun! One of the best facilities at Le Brasilia is its swimming pool complex. At the heart of the campsite you’ll find wonderful terraces where adults can sit back and relax along with 5 great tropical styled swimming pools which will provide a whole lot of fun for children and a relaxing space for adults. You’ll also find some water slides built into the rock features to give that added touch of excitement. Le Brasilia campsite offers a comprehensive selection of activities and facilities on site and also nearby to ensure you have a fantastic family holiday. On-site activities at Le Brasilia campsite include table tennis, football, badminton, basketball, volleyball, running track, gym, archery, boules, playground and cycle hire. Facilities available at Le Brasilia campsite include WIFI, restaurant, takeaway, pizzeria, bar, groceries, butcher, gift shop, games room, animation team, washers and dryers. Accommodation at Le Brasilia campsite includes a range of 2 and 3 bedroom mobile homes that are available from Eurocamp and Al Fresco Holidays.